Normally felt as a numbness and tingling in the hand and arm, carpal tunnel syndrome is a medical condition that occurs by the pressure on the median nerve (pinched nerve) narrowing the carpal tunnel. The median nerve runs the length of the arm and goes through a narrow passageway called the carpal tunnel and ends in the hand. Carpal tunnel syndrome should not be taken lightly as it affects 3% to 6% of Americans aged 18-64 each year. Some common conditions that can lead to carpal tunnel syndrome include obesity, hypothyroidism, arthritis, diabetes, and trauma. Repetitive motions, like typing or any monotonous motions of the wrist (especially when the hands are lower than the wrist) can also lead to this condition. Normally, no single cause can be identified. Timely diagnosis and proper treatment can relieve the symptoms and restore the hand and wrist functions. If you feel that your are affected by carpal tunnel syndrome, call our specialists at Spine & Orthopedic Center at 888-409-8006 to schedule an appointment in any of our offices throughout Broward and Palm Beach counties: Boca Raton, Deerfield Beach, Coral Springs and Plantation. Treatments for a diagnosed carpal tunnel syndrome should begin as early as possible. If the patient experience moderate symptoms, wrist splinting and other conservative treatment options can help. 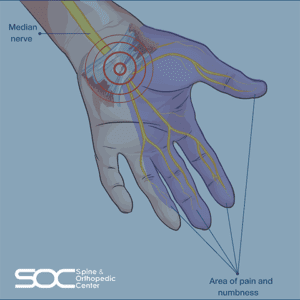 For severe symptoms or patients not responding to conservative treatments, surgery may be considered in order to relieve the pressure on the median nerve. One of the most common recommendations to treat carpal tunnel syndrome, is a wrist splint, specially at night to help relieve nighttime symptoms or during an activity known for causing stress on the wrists. It is also a good option for pregnant patients. Corticosteroids, such as cortisone, can reduce the discomfort due to its ability to reduce inflammation and swelling. Corticosteroid injections for carpal tunnel syndrome can be effective and provides temporary relief. They are normally performed under ultrasound guidance. Endoscopic surgery – the surgeon severs the carpal ligament through one or two small incisions (~ 1/2 inch) in the wrist and palm helped by a microscope-like device and a camera attached to it to see inside the carpal tunnel. Open surgery – the traditional procedure where the surgeon makes an incision (up to 2 inches) in the wrist to cut the carpal ligament in order to widen the carpal tunnel. This procedure is performed on an outpatient basis.